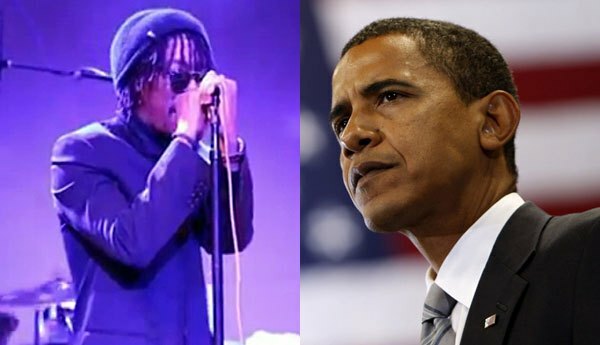 Lupe Fiasco was the headline act at Obama's Inauguration Celebration at Washington's Hamilton Live. Lupe had it planned that rather than the expected hip hop songs he instead served up some poetical justice out against Obama. Full video after the Jump. "I really think the war on terror is a bunch of bullsh*t"
Organizers quickly cut off Lupe's mic, but he continued to stubbornly rap for another 10 minutes acapella before being pushed around then escorted off the stage. "Lupe Fiasco just got thrown off stage..
eventually a team of security guards came on stage and threatened him to go." Hypervocal who organized the event insisted that they did not kick Lupe off the stage for his anti-Obama views. free speech, and free political speech. This was not about his opinions. Instead, after a bizarrely repetitive, jarring performance that left the crowd vocally dissatisfied, organizers decided to move on to the next act." The school was garbage in the first place, that's on the up and up..